This video shows how to quilt a panto within a border. This video was made before we had the clip/pause marker update so I would encourage you to view that video also and adapt this method incorporating the clip/pause marker as you quilt your quilt. 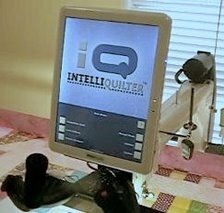 This video is showing how to record a pattern using the Intellliquilter.